Poor Jeremy Corbyn. 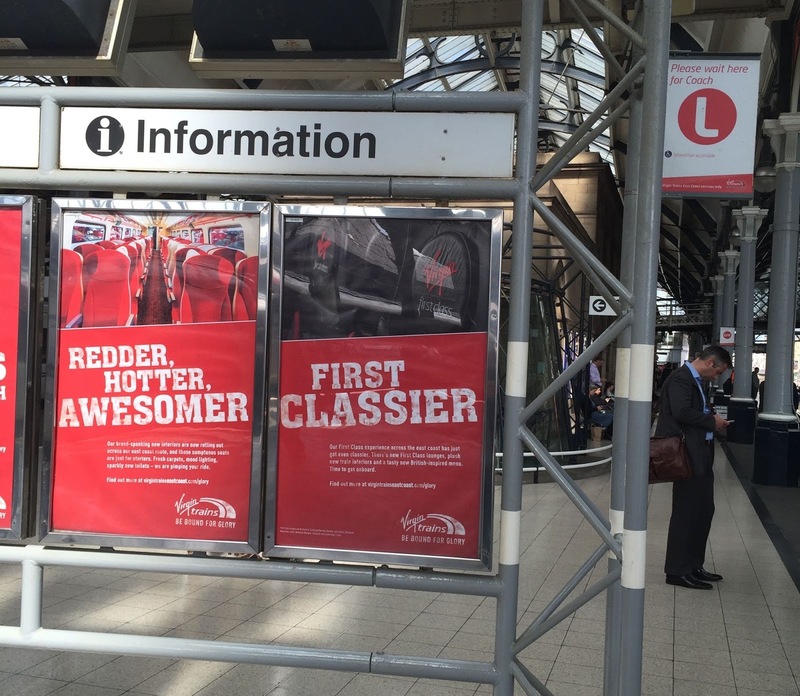 This week he bought a Standard Class ticket on a Virgin train from London to Newcastle without a (free) seat reservation. Didn’t he know that he’d have to spend the entire journey sitting on the floor? Or at least long enough to be filmed by a conveniently placed film crew. Now he wants to re-nationalise the railway: that’ll teach ‘em. 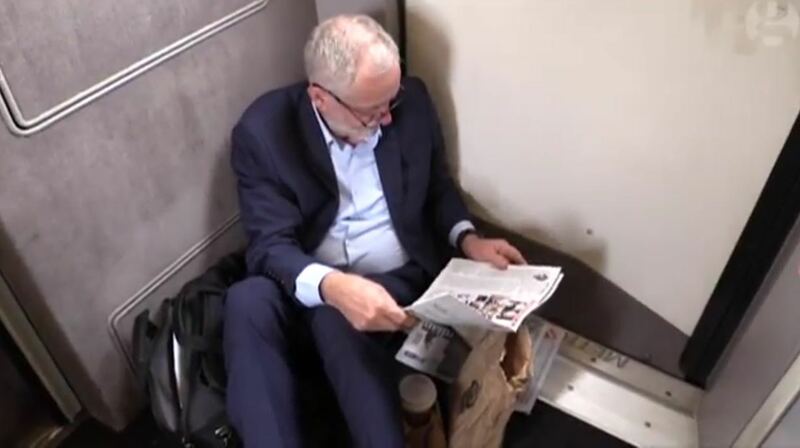 The Labour leader wouldn’t consider upgrading to First Class, even though the air-conditioned coaches had empty seats aplenty. 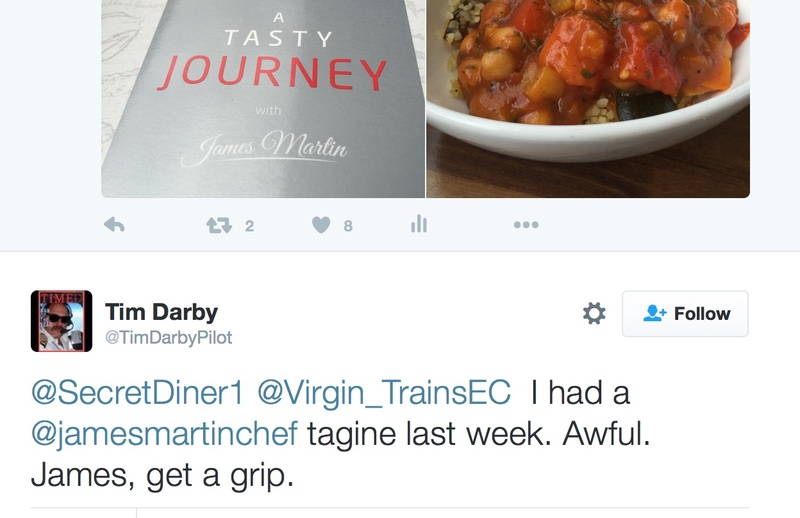 So, sadly, Mr Corbyn couldn't sample Virgin’s culinary treat: a Tasty Journey with James Martin. Here’s what he missed. For those who haven’t watched daytime television for the past ten years, James Martin is a celebrity chef. He’s better known as a TV presenter than a cook, and was something of a housewives’ heartthrob until he left his Saturday Kitchen job earlier this year. Quite why he disappeared from our screens I’m not sure: one broken-egg omelette too many, maybe. Now he’s putting his brand about. 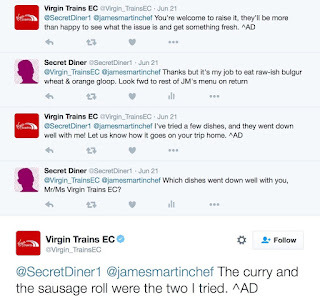 There’s a restaurant in a Manchester casino called James Martin Manchester; he makes adverts for Asda; and he certainly appears to be very hands-on with Virgin Trains. Normally I wouldn’t have reviewed this meal, which I endured a few weeks ago. It was so unbelievably awful that its memory deserves to be buried along with James Martin’s reputation. But thousands of people have to travel by train from our region to London every week; they need to be warned. 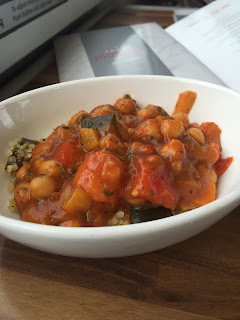 I should have taken the advice of one North East food blogger, who read my tweeted outburst: “gloopy veg tagine with grit” and responded that she was on another Virgin train at the same time, but was foregoing the food, and instead “came prepared with M&S goodies”. Wise old Scran on the Tyne (Lauren Archer). 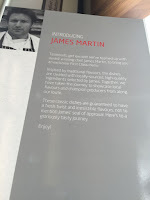 Inside the glossy menu was a picture of the chef looking rugged and a headline: “Introducing James Martin”. The copy wasn’t about him, but his food. “Tastebuds, get excited!” it said. Mine did their best, helped along by a huge tumbler of warm white wine, dispensed by trolley. 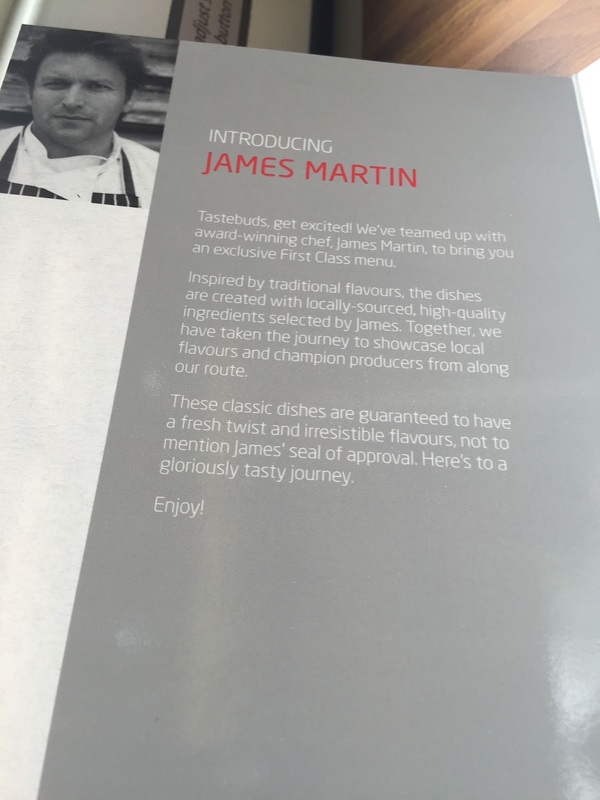 “We’ve teamed up with award-winning chef, James Martin, to bring you an exclusive First Class menu,” it went on. 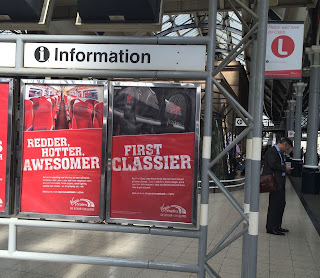 Even the posters on the station platform had promised: First Classier. Clearly this was to be no ordinary train food. I wondered which traditional flavours James had selected from our two stops, Darlington and York. Or maybe he’d chosen them from the places we stormed past enroute: a taste of Durham, or a sniff of Northallerton. I was pretty sure there was nothing of culinary note in Peterborough, but maybe he’d uncovered something spicy in Doncaster. You can imagine my disappointment, then, when I discovered that the menu had missed the point. My “choice” of five items were: a chicken & bacon wrap (British); Cheese ploughman’s sandwich (Lake District cheddar); vegetable tagine or Moussaka (maybe there’s a large Moroccan and Greek population in Darlington?). Finally, I spotted one local speciality: “Yorkshire rare-breed gourmet sausage roll”. Sadly, they were all out of sausage rolls. I made do with the vegetable tagine. Spicy chickpea and butternut squash (not exactly local ingredients), served with herb bulgur wheat. It was indeed gloopy with grit. I could have added the words “weirdly orange”. The bulgur wheat was almost raw. 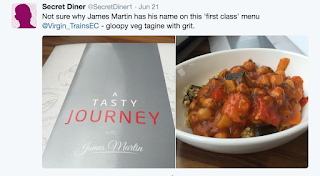 Suddenly up popped another tweet: “On board @Virgin_TrainsEC today!” It was @JamesMartinChef himself. Not on my train, but another. So I told him what I thought of his tagine. And, quick as a flash, he replied. I said: “Would rather mention it to the feast's creator than bother the innocent, nice people serving it up” (the service was really rather good). “Thanks but it's actually my job to eat raw-ish bulgur wheat & orange gloop. 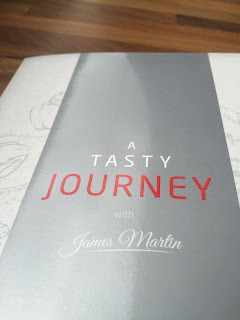 Look fwd to rest of James Martin’s menu on my return trip”. 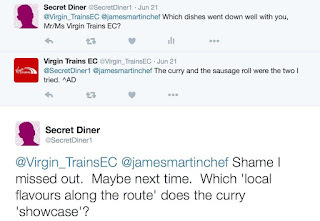 “Which dishes went down well with you, Mr/Ms Virgin Trains EC?" The curry wasn’t on today’s menu. Maybe next time, I said, adding: Which 'local flavours along the route' does this curry 'showcase'? I never got an answer. However, by this time, others were chiming in. “I had a James Martin tagine last week. Awful.” said one; “The whole menu is poor in my humble opinion,” said another; “I'm guessing James Martin received a substantial fee to put his name to that menu,” observed a third. Quite. 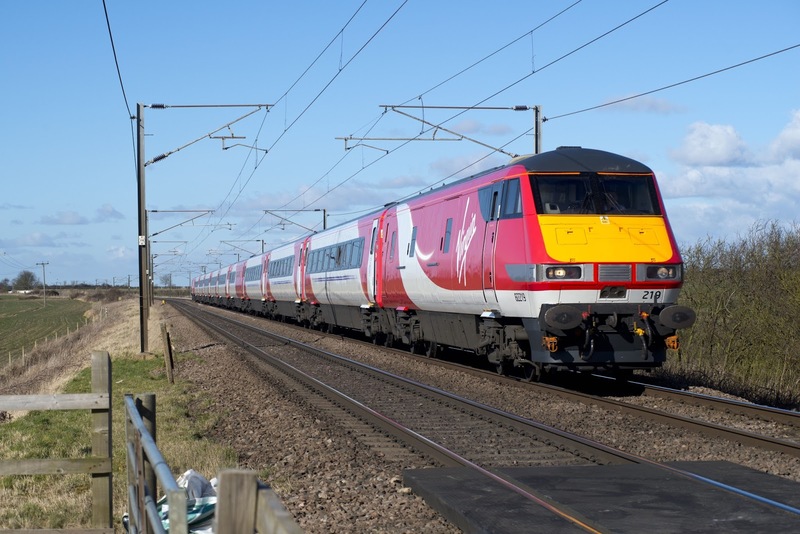 Some of us remember the old days of the restaurant car and the silver service, the poached salmon and garden peas and boiled potatoes that fell off the waiter’s spoon as we lurched round the bend. I know those days are long gone. But I resent being sold a load of PR hype when, actually, Virgin are just trying to give passengers, who have paid hundreds of pounds to travel with them, the bare minimum to avoid starvation. Or so it seems. No way was this a “Tasty Journey”. I did try the rest of the menu on the return trip. Not the sausage roll, for the man next to me had one that looked ever so dry – a gourmet sausage roll in need of a gourmet. So I went for the moussaka. Alongside some undressed salad leaves, it was a dismembered dish, the potato, bechamel, minced lamb and aubergine assembled together on the plate. I guess James Martin would call it 'deconstructed'. At least the aubergine was tender. But the sauce tasted of something foreign. 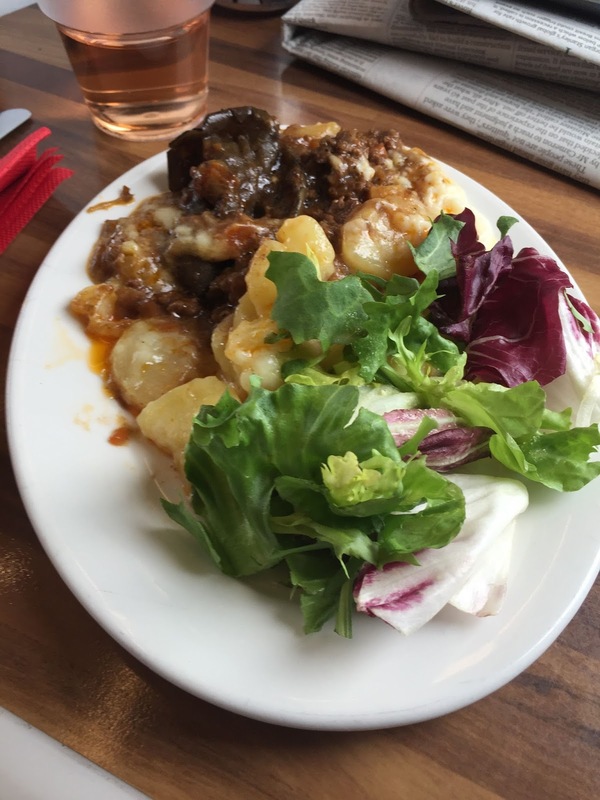 Not something Greek, something out of place in a moussaka. I couldn’t put my finger on it: was it some kind of preservative? Or was it a particularly strong type of gravy granule? It vaguely reminded me of the sauce in a Marks and Spencer lasagne from decades ago, before they improved the recipe. So I ordered a second tumbler of warm wine, to take the taste away, and dreamt of M&S goodies. I have never seen such a biased review in my life, it kills all credibility in this organization! Firstly James Martin has been a successful chef for over 20 years, long before his TV days! His restaurant in Manchester has been open for 3 years, not something he's just put his name to! I've had the pleasure to eat there on a number of occasions and the food and service are excellent! 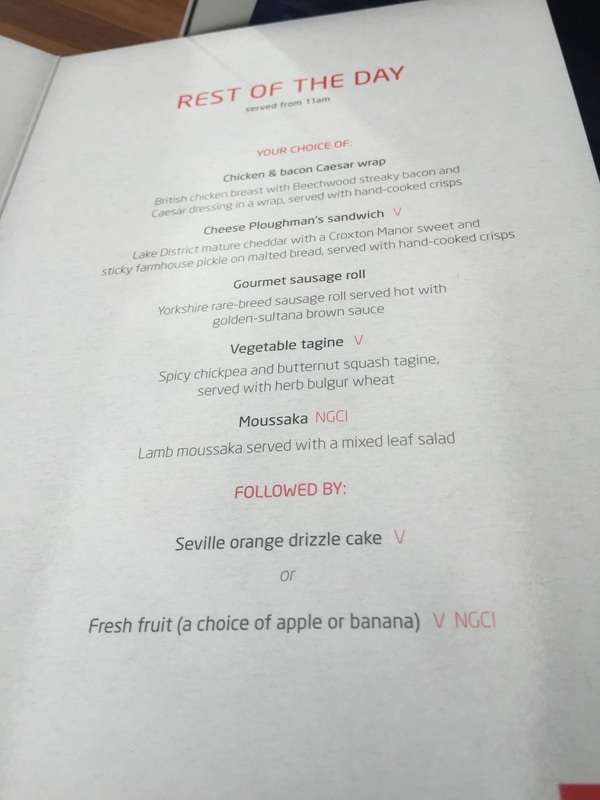 I know people who have had the food on Virgin EC and have said it was very good, admittedly they didn't have the tagine, but have had several of the other meals. I think the real reason for this review lies in the comment that you'd like to bury Mr Martins reputation! Is that really appropriate for someone who professes to be honest and fair? It undermines the whole credibility of everything you've written! Very unprofessional! I have never seen such a biased review in my life! Firstly your facts are inaccurate, James Martin has been a successful chef for over 20 years, long before his TV days. His Manchester restaurant has been open for 3 years, not something he's just put his name to! I've had the pleasure to eat there on several occasions and the food and service were top class! But the most telling part of the review is saying it should be buried along with James Martins reputation! Does that type of comment have any place in a proper, supposed unbiased review? Really? It undermines the whole value of the article! Vindictive rubbish! What I actually wrote was: "It was so unbelievably awful that its memory deserves to be buried along with James Martin’s reputation." 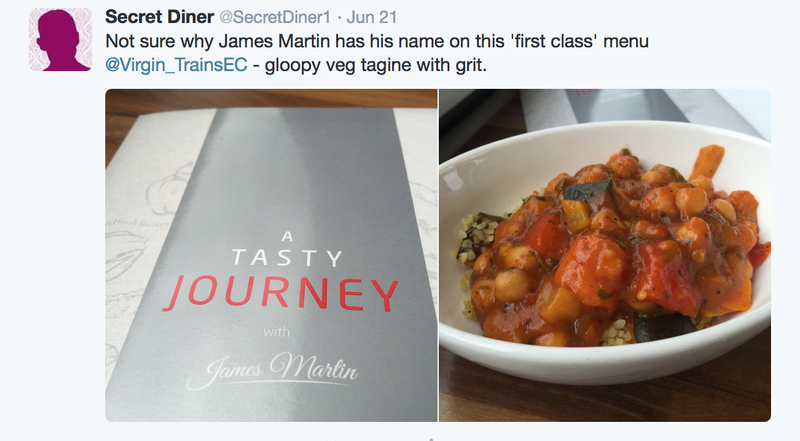 It was Mr Martin who put his own reputation on the line, as far as customers of Virgin Trains are concerned, by passing off this food as his own. He didn't have to put his name to it, but because he did, his reputation must take the consequences. 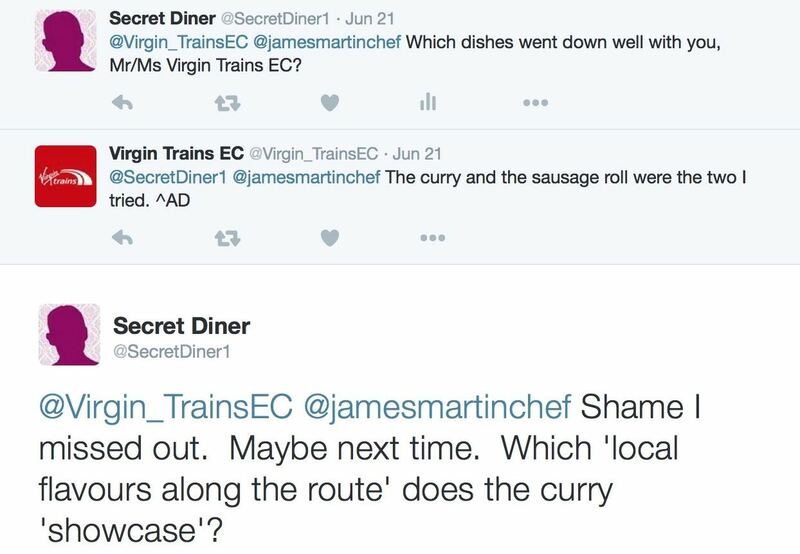 The fallout includes a large number of tweets and emails I've now received from very disgruntled Virgin Trains diners, every one of which (other than your own) strongly agrees with my verdict. Firstly I still think the comments in your piece are very biased against Mr Martin, as does the other person whose put a comment on the piece, so it's not just me. Secondly I know people who have had the curry, muffins and sausage roll and said they were lovely, I have to say vegetable tagine is likely to get more criticism, however good, because like my two adult sons the mention of vegetables puts them off! Thirdly there's the 'Trip Advisor' effect, one person puts something bad and everybody jumps on the bandwagon and joins in, probably like me never having eaten it. Are you really suggesting the two near-identical comments on this page, both starting 'I have never seen such a biased review in my life!' and both including phrases like 'James Martin has been a successful chef for over 20 years, long before his TV days', weren't written by the same person?? Perhaps you'd now also like to compose some anonymous comments on behalf of the people you know "who have had the curry, muffins and sausage roll and said they were lovely". They certainly haven't written to me. 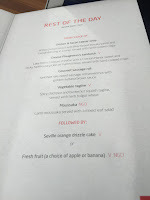 I totally agree with your comments on Virgin Train’s 1st class menu (last week’s Journal). I'd just returned from a trip to London & couldn't believe that James Martin would lend his name to such rubbish. I had the sausage roll on the way down thinking it must be 'gourmet' style: how wrong can you be – it was cheap & nasty with a grey fatty filling. Greggs can do better (and I'm not a Greggs fan!). I decided to have the cheese & pickle sandwich on the return journey thinking it had to be better - wrong again! It was floppy, wet & stuck together. All the food was paraded down the carriages uncovered and level with people talking and breathing over it. Well done to you for highlighting a dreadful service. Your review of the "first class" dining on Virgin Trains East Coast was spot on. It's all fur coat and no undies. It's utter tat, but served up by pleasant, competent and busy staff. It's as local as a penguin on the Farne Islands. The glossy menus are impressive though. They should bin James Martin and get John Calton or Kenny Atkinson on the case. 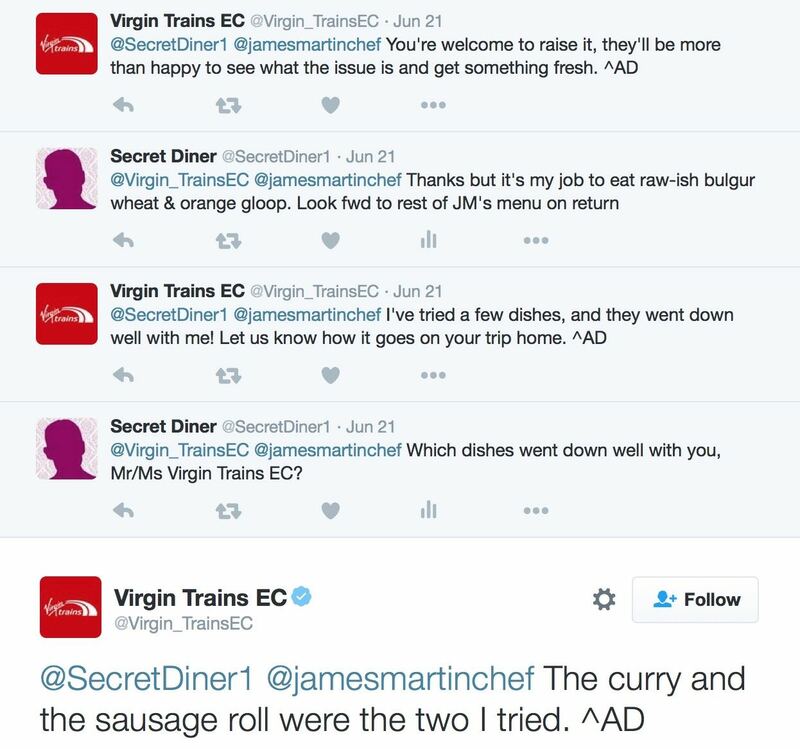 "I agree Virgin Train’s food is dire. I’ve been travelling 16 years – it’s a slow inexorable downhill trend." Biased? I think not. Just accurate. Anything I comment on has my name on it, I don't hide behind anonymous! Maybe its a like minded person who sees the bias against James Martin! As for the peoples comments about passengers breathing on the food and soggy cheese sandwiches, surely that's down to the train company staff? Nobody can seriously expect James Martin to be running up and down every train with face masks to stop people breathing on stuff! No, you don't hide behind Anonymous, you hide behind someone called Unknown, whose link, when you click on it, goes to exactly the same Google account as 'Lynn Banks'. What a coincidence! Next time you want to pretend to be another reader, I suggest you use the 'Comment as Anonymous' label that I have provided in the drop down menu. Over and out, whoever you are. I agree wholeheartedly with your review of the Virgin East Coast "Tasty Journey" menu. As a frequent VTEC traveller, I can honestly say the food has gone steadily downhill to the point I am starting to bring my own (and starting to consider standard class rather than 1st). To serve a sausage roll with pastry so flaky it goes off like a booby trap when you bite it is a nightmare for business travellers who don't want to arrive for their meeting covered in greasy crumbs. A sausage roll is the kind of thing 14yr olds buy from Greggs for their school lunch, not the kind of thing a grown up would eat for breakfast, lunch or dinner (VTEC love the sausage rolls so much they serve them for every meal). Mind you, as you attempt to sweep the crumbs from your shirt you should consider yourself lucky you are getting anything hot at all - and indeed a plate - the latest wheeze seems to be serving chilled, clammy sandwiches and wraps direct in the box. Like a second rate hotel packed lunch. The days of a restaurant car with a tablecloth and real wine glasses are a distant fading dream.